When under threat, the pufferfish quickly inflates into a spherical shape to help it ward off and escape predators. Until now, biologist had thought that in this state the pufferfish – also known as the blowfish, toadfish or sea squab – holds its breath all the while, but this assumption has been overturn by the findings made by Australian researchers who not only discovered this isn’t true; on the contrary, the blowfish actually intakes five times as much oxygen than in resting state. Having one of the most iconic predatory escape mechanism in popular culture will invariably attract all sorts of stereotypes or wrong assumptions – with much of the credit having to go to “Finding Nemo”. I’m not sure how this breath holding myth came about, since the blowfish doesn’t inflate with air, although some species use air – but only a bit. 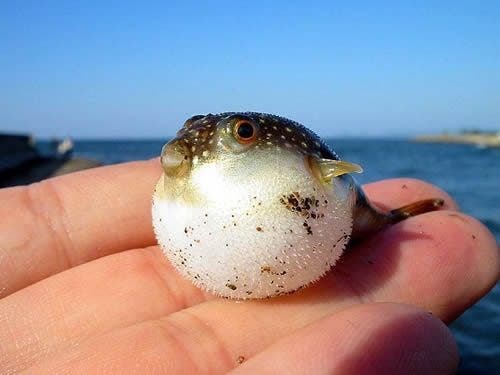 To blow itself out of its regular proportions, the puffer quickly ingests huge quantities of water to turn itself into a huge inedible ball several times its normal size. To make themselves even more unappealing, some species also employ spikes. The team ran tests on eight black-saddled pufferfish (Canthigaster valentini) from Australia’s Great Barrier Reef and put them in separate tanks. When the puffers inflated to about four times their normal size, the quantity of oxygen was measured in the tank. If the fish had hold its breath, then they’d see oxygen levels constant. What happened was the opposite. The puffer actually gobbles up a lot more oxygen than it does in its normal state – about five times more. It makes sense too, since they need to compensate for their lower metabolic rate. Puffers evolved this ability to swim better and faster when under threat. When not inflated, the puffers are very slow, clumsy and vulnerable to predators. While inflating itself will help it escape once, it won’t work too well the second time. The fish needs 5.6 hours before it can return to typical metabolic levels. A tired prey is an easy catch, but it’s better than nothing. 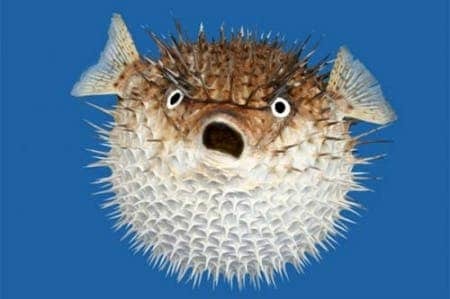 Actually, the puffer is trickier than meets the eye being extremely poisonous. The poison is called tetrodotoxin, a substance that makes them foul tasting and often lethal to fish. To humans, tetrodotoxin is deadly, up to 1,200 times more poisonous than cyanide. There is enough toxin in one pufferfish to kill 30 adult humans, and there is no known antidote. Oddly enough, the puffer is considered a delicacy. Called fugu in Japan, it is extremely expensive and only prepared by trained, licensed chefs who know that one bad cut means almost certain death for a customer. The findings appeared in Biology Letters.